Article 7 - CANCELLATIONCONDITIONSNotification of any cancellationmust be provided by registered mail or by email:a) Before the contract becomeseffective: as a general rule, the deposit shall be retained by the owner.However, the deposit shall be returned if the gîte is able to be rented out toanother party for the same period and at the same price.b)If the guest does not turnup within 24 hours of the date specified on the contract, without havingnotified the owner:- This contract is consideredto be terminated,- The deposit shall beretained by the owner,- The owner may use the gîte.c) If the rental contract iscancelled by the owner then he shall pay the guest double the deposit which hehas received, except in the case of force majeure. GENERAL TERMS AND CONDITIONSIn no circumstances can the guestclaim any right to remain on the premises beyond the rental period initiallyprovided for by this contract, without the written agreement of the owner, andwithout a new rental contract being signed.No modification (deletion,surcharge, etc.) shall be accepted in the drafting of the contract without theagreement of both parties. Article 1 - USE OF THEPREMISESThe guest shall enjoy the useof the gîte in a peaceful manner and shall use it properly, in compliance withthe purpose of the premises. Upon his departure, the guest commits to leavingthe gîte clean and in the way that he found it upon arrival. The rental cannotbe for the benefit of a third party under any circumstances, except with theprior agreement of the owner. The owner shall provide the gîte conforming tothe description he has provided of it and shall maintain it in such a way thatit is fit for purpose. Article 2 - SCHEDULE OFCONDITION AND INVENTORYThe schedule of condition andthe inventory of the furniture and the various equipment shall be done by the owner,or his representative, and the guest at both the start and the end of the holiday. Article 3 - PARTICULARCIRCUMSTANCES-Ifthe number of guests exceeds the capacity indicated on the contract, withoutthe owner's prior agreement of this, then the owner reserves the right todemand that a supplement be paid by each additional person present or to refuseaccess to the additional guests if the maximum occupancy capacity would bereached and therefore safety conditions would be violated.-Theuse of the land for additional persons shall be subject to the priorauthorisation of the owner and to an additional payment.-The guest shall be fullyresponsible for adults or children using the pool.-Under no circumstances shallthe owner be held responsible for failure to comply with safety rules regardingthe use of the pool, the spa and the pool and spa areas.-Please refer to the rulesspecifically relating to the use of the pool and the spa. Article 4 - SECURITY DEPOSITThe security deposit shallamount to the equivalent of 2 weeks rent, at the most. As a general rule, itshall be returned to the guest upon departure, following the schedule ofcondition. In the case of loss or damage to the gîte caused by the guest, thedeposit amount shall be reduced by the cost of repairing the damage or thereplacement cost amount upon presentation of documentary evidence by the ownerand this shall be provided within a maximum of two months. Article 5 - PAYMENTThe reservation shall becomeeffective once the guest has returned 2 copies of the contract along with thedeposit, that is 30% of the holiday,before the date indicated on the contract. The rent balance shall be paid 15 daysprior to arrival at the gîte. If the guest shall delay his arrival then he mustadvise the owner of this and must pay the rental balance 15 days prior to theinitially agreed rental start date. Article 6 - CURTAILMENT OFHOLIDAYIn the case of a curtailmentof the holiday initiated by the guest, and if the owner's responsibility is notbrought into question, then he shall not be entitled to any refund, other thanthe security deposit. Article 8 - INSURANCEThe guest must obtain"personal and family" civil liability holiday insurance. He musttherefore verify that his main housing policy can be extended to the holidayrental property.Personal or valuable property,regardless of the value of this, and vehicles parked on the owner's land arenot covered by the owner's insurance. Article 9 - PARTICULAR CONDITIONSThe guest must close and lockall of the gîte's shutters, even when he is just going out for a short periodof time.In order to avoid the pool'sfiltration system (pump) being damaged by grains of sand from the beach, it ishighly recommended that swimwear worn in the pool is not worn to the beach. Article 10 – TOURISM TAXThe tourism tax is obligatoryand is collected by the owner and then paid in full to the village Mayor. Article 11 - COMPLAINTSComplaints must be put intowriting within the first three days of the holiday for any dispute regardingthe schedule of condition or the descriptive statement. Article 12 - PETSPets (dogs) are only permittedwith the approval of the owner. The owner reserves the right to refuse entry toany person who has not declared in advance that he is bringing pets. In thiscase, no refund shall be given. The Estate "de La Réparade" is part of a big property of 45 hectares of forest. 7 cottages from 2 to 12 people are available all year round for your pleasure. 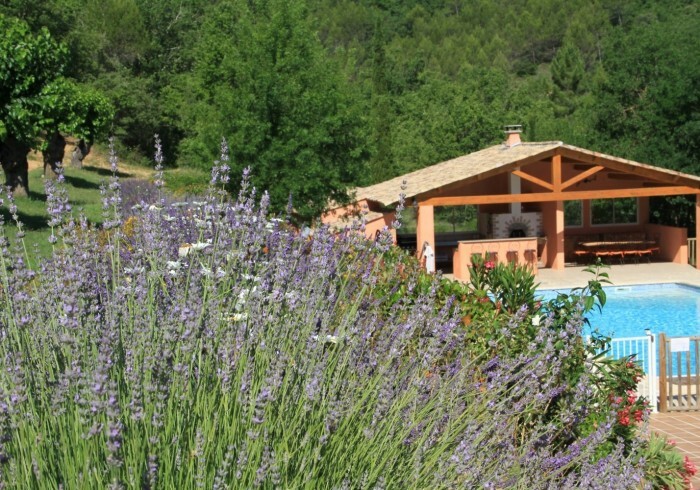 Situated in the green Provence it is located near the village of Châteauvert and 45 min. away from Aix en Provence, 55 min. from Marseilles or St. Tropez. Shopping is in Brignoles or Barjols 15 min. away from the estate. 2 min. away, the Vallon Sourn is well known for climbing and canoeing. Lovers of outdoor activities will be thrilled by the many posibilities existing in the vicinity.